Well, Eli is retired so he is outsourcing to Gavin Schmidt who,explained it all in a series of tweets with the BlackPhysicists Tweeter. They actually, between them had a real conversation of value, which Eli here unrolls. Below the BlackPhysicists are in italic. Gavin does the rest. The sequence started with. I’d say to start with thermodynamics. Heat, density, convection and then Clausius-clapyeron. Condensation/evaporation and conservation of mass/energy, you have most of the principles. Coriolis rounds it off. @BlackPhysicists In almost every broadcast meteorologist's report we hear the term "weather model." What are weather models, exactly, and how do they work? @BlackPhysicists There are enough wildfires and volcano eruptions happening at one time to effect #weather on a large scale? Good Q. Small volcanoes and fires add to the background climate for sure. Impacts on weather forecasts are more subtle, but by changing where solar/IR energy is absorbed/reflected they can affect temp gradients and hence dynamics. @BlackPhysicists What do you think re: best practices to teach probability & stochasticity, parameterization & estimation, error and bias? More Chaos theory/Lorentz attractor etc. Parameterisation and emergence are trickier but there are some @TEDTalks on that. I generally don’t find that numerical analysis as taught is particularly useful though. 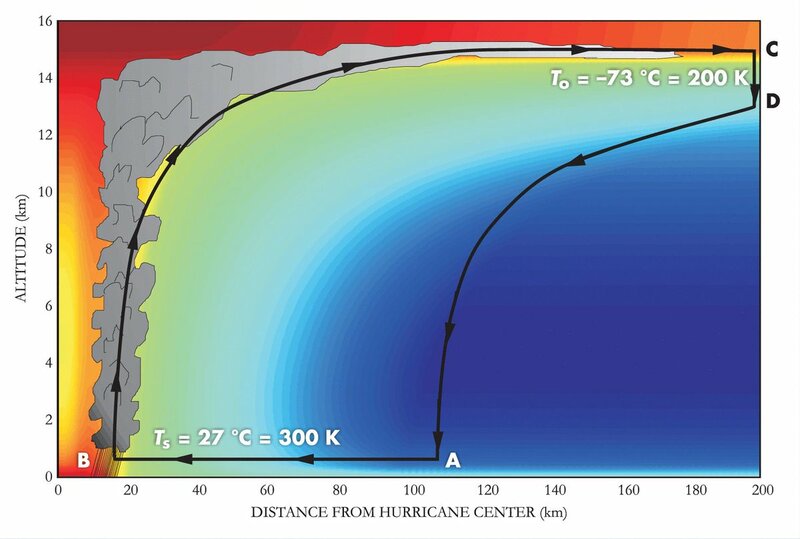 Dust can affect hurricane development (at least it has been hypothesized to). And smoke/aerosols impact air quality directly - something weather models are increasingly predicting as well. @BlackPhysicists In fact the group at @NCASNews led by @vernon_morris is expert on dust from the Sahel leading to African Easterly Waves and Western Hemisphere hurricanes. I think in this presentation there a slide showing North American hurricane tracks emanating from the Senegal, Gambia area. @BlackPhysicists Switching gears to #climate physics, in your experience do students have difficulty understanding the difference between weather and climate? This seems to be a major problem in TV punditry and probably most public discourse on weather and climate. Actually no. Once explained - lots of good metaphors available - ppl generally get it. The ‘confusion’ one sees in punditry is fake - a position taken for rhetorical effect rather than any real misunderstanding. Here’s a good metaphor. Climate is the clothes in your closet, weather is what you are wearing right now. The weather is constrained by the climate (you can’t wear clothes you don’t have), and the closet can change over time (new purchases/gifts), sometimes abruptly! @BlackPhysicists What are the basic equations from #physics of a good climate model? What are the dichotomies (false or otherwise) between ‘weather’ models and ‘climate’ models? Atmospheric physics is basically the same - slightly different levels of truncation (spatial resolution etc) since climate models have to run longer and with more components (oceans, sea ice, composition, biosphere (to some extent)). But major difference in conservation properties and ingestion of observations. For a weather model, continual updating with observations means small businesses imbalances don’t matter much. But climate models don’t ingest obs like this so small biases can build (model ‘drift’). Conservation is key. Other issues are the diagnostics one is interested in. With weather, you want the specific trajectory of storms/fronts etc, with climate you want the statistical description (how many storms/what tracks) because that is where the skill is. Actually, understanding the notion of skill is key for both kinds of model - how can you judge if a model is useful despite it not being perfect? @BlackPhysicists @RogerAPielkeSr offers a lot of great resources in both #weather and #climate. One defn he's offered: Definition 1:Weather is separated by climate just by averaging time period; e.g. a 30 year time average temperature we call "climate"
That’s been true historically, but that’s a little arbitrary and not fundamental. I would prefer a distinction based on forecasts of specific trajectories vs statistics of trajectories. An example might help. Take Mt Pinatubo eruption. A very large forcing on the climate system, which had detectable impacts on rainfall, temperature, wind patterns. It didn’t extend the predictability of weather forecasts, however the statistical impacts were predicted skillfully by climate models. Those climate forecasts were for 1, 2, 3 years out. Much shorter than the ‘30 year’ period you mentioned. The issue is one of signal and noise. For slow changes in forcings (or none), 30 years is a good period to average out a lot of internal variability. But for a big signal (like Pinatubo), the climate impacts easily exceed the ‘noise’ of the weather. Same with the seasons! (Note ‘noise’ here isn’t pejorative- one person’s noise is another’s signal after all). Bottom line, there is no longer single time period that separates weather and climate. 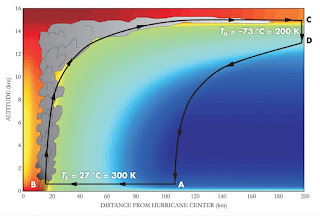 How do you bridge weather models' that are built on 1st principle physics (continuity, Navier-Stokes, advection-diffusion of energy) to climate models? The latter isn't just long-time simulations of the former on meaningful grids and timesteps? They aren’t different in principle. But all these models need to have a scale (in time/space) below which they are not resolving the ‘true’ equations. For weather models that scale is a little smaller than for climate models, but for both it’s getting smaller over time. @BlackPhysicists Jan 12 More #iteachphysics @ClimateOfGavin you've been a great help today. Before we end, there are 2 related concepts sea surface temperature and ocean heat content. How can we best explain to students the difference between the two? More Sea surface temperature is a diagnostic of what’s happening at the surface (duh!). It’s the field that has the direct connection to the atmosphere (via radiation, evap etc.). It is changes in SST that allow for the planet to requilibirate to any change in radiative forcing. @BlackPhysicists If you have time, could you give your take home message from the @NatureClimate paper that was in the news this week. @BlackPhysicists I think I meant this report, which is more from an IPCC report at not the @NatureClimate paper. It's kind of covered in the @RealClimate piece I tweeted earlier. As non-climatic artifacts are removed from the OHC analyses and more data is being ingested from Argo etc, the predictions from GCMs are being nicely validated. This is incredibly nerdy, and useless, because you are dealing with a population which doesn't know what's the square root of 49 and can't figure out the Guardian's atomic bomb amounts to 0.3 billionths of a degree C. You are dealing with a culture where it's more important to learn the 32 gender pronouns of the left, or the 10 best sniper scope mountings of the right. You are toast. Eli, TEACHING THERMODYNAMICS to the general public is like teaching a canary not to defecate in the bird bath. It's not possible. You are just too educated and smart to be in touch with the public at large. Haven't you noticed how their eyes glaze and they start to drool when you mention heat capacity? FL: "TEACHING THERMODYNAMICS to the general public is like teaching a canary not to defecate in the bird bath." BPL: Because only the elite can learn. The stupid masses cannot learn. They must be led by the leaders! After years of watching Gavin Schmidt run interference for the indefensible hockey stick and his cowardly refusal to debate colleague, Roy Spencer, he impresses me as a pompous flim-flam man who's trying to turn the chaotic, non-linear field of climate science into a priesthood that's closed to outsiders. "You are dealing with a culture where it's more important to learn the 32 gender pronouns of the left, or the 10 best sniper scope mountings of the right." But learning and understanding the basics of thermodynamics is easier than the 32 pronouns or the relative merits of sniper scope mountings. Or the other things that the culture deems important like the mating habits of the Kardasians. Perhaps our culture is sub-optimal in the importance it ascribes to various fields of knowledge. c: After years of watching Gavin Schmidt run interference for the indefensible hockey stick and his cowardly refusal to debate colleague, Roy Spencer, he impresses me as a pompous flim-flam man who's trying to turn the chaotic, non-linear field of climate science into a priesthood that's closed to outsiders. BPL: After years of watching Canman post pseudoscientific garbage and indefensible attacks on scientists, he impresses me as just another internet crackpot with a PC and a mind that's closed to evidence. Your sniper scope mountings are only fit for hunting snipe.